I, Calvin McQuesten of Sandborton County of Strafford state of New Hampshire considering the uncertainty of this mortal life and being of sound mind and memory acknowledging the Blessing of the Almighty God for the same do hereby make and publish this as my last Will and Testament. I give and devise to my Beloved Wife Margarette Barker [Lerned]2 all my Real Estate together with all privileges and appurtenances thereunto and assigns forever. I also give and devise to my Beloved wife Margarette Barker all my Personal Property that shall remain after my just debts are paid my bank stock together with my goods chattels and effects of whatsoever kind or nature and I appoint my said Beloved Wife Margarette Barker sole executrix of this my last Will and Testament (and I order her to pay my just debts) and thereby revoke former wills by me made. In witness whereof I hereunto set my hand and seal this Twenty third day of June in the year of our Lord eighteen hundred and thirty two. Signed Sealed published and declared by the above named Calvin McQuesten to be his last will and Testament in the presence of us who have hereunto subscribed our names as witnesses in the presence of the Testator. 1 This is an early will of Dr. Calvin's. He made several throughout his lifetime and died on October 20, 1885, leaving the major part of his estate to his two sons, Isaac Baldwin McQuesten and Dr. Calvin Brooks McQuesten and he left an annuity to his third wife, Elizabeth Fuller McQuesten, who went back to the U.S. to live. His son Isaac inherited the house, then named "Willowbank" but soon changed to "Whitehern." 2 Margarette Barker Lerned McQuesten died in 1841. 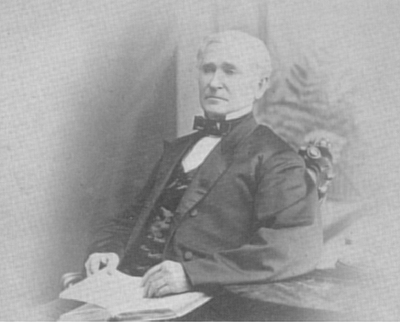 Dr. Calvin then married Estimate Ruth Esther Baldwin in 1844, and she died in 1851. He then married Elizabeth Fuller in 1853 and she outlived him. He died in 1885.